FRP Mission accomplished on Sept 2nd when we planted 1140 saplings and watered all of them. FRP was a really big event involving lots planning, preparation, hard work at field etc etc. To make this event success many have contributed like Forest Detpartment officials (RFO, Forester, Guard, Watchers etc), local people etc. And the hard work of 11 member team from BASC in planting and watering have made this event possible. Thanks to Anitha MS, Chirag Dedhia, Durga Shankar, Karthik HK, Rudra Aradya, Santhi Sree, Vasanth, Venkat, Vinay MP and Vinuthna Y. 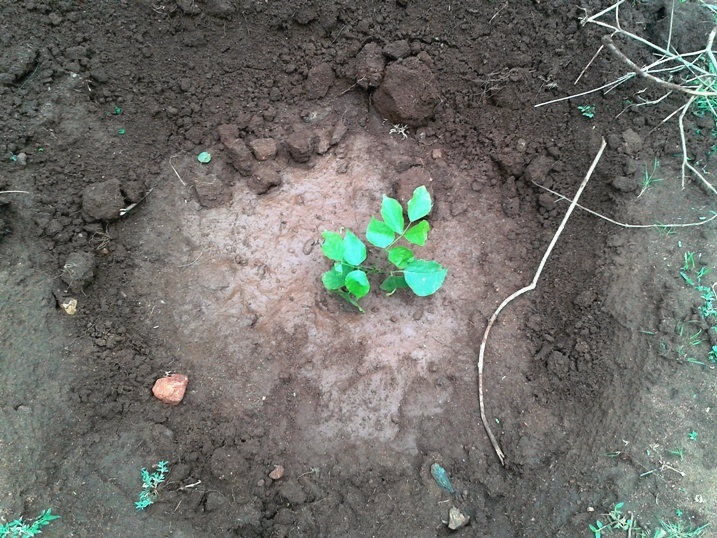 Task: Planting young plants (saplings) in pits and watering them. "Gift your future generations with abundant natural resources and non polluted environment rather than money/property/assets because money can not create all these." I strongly believe in this and in my journey towards this I joined the Bangalore ASCENDers (BASC) group for great event “FOREST REGENERATION PROGRAM” (FRP) since I’m very much interested in it. One Man Thought+ Hundreds of members Contribution+Fourty people Hardwork+16 hours work=1140 saplings plantation in a Forest. Ambareesh Karanath is a core member of BASC, he had initiated the Forest Regeneration Program(FRP). Many members of the BASC had contributed for this event. Fourty people are the Forest Department officials (RFO, Forester, Guard, Watchers etc)+ local people +11 members from BASC. Second phase of FRP event is done on September 1st and 2nd. This Forest is a scenic place with hills all around, the top of the hills are covered with clouds and a reservoir in the down of the hills but unfortunately rainfall is very less here :( Second phase of FRP involves the following targets 1) Planting 1140 saplings in the pits which were dug out in the phase 1 (on 19th & 20th May) 2) Watering the 1140 saplings by getting water from the near by reservoir! To complete the First target asap we had taken the help of local people, We formed as a team of 2-2 members and started planting the saplings. 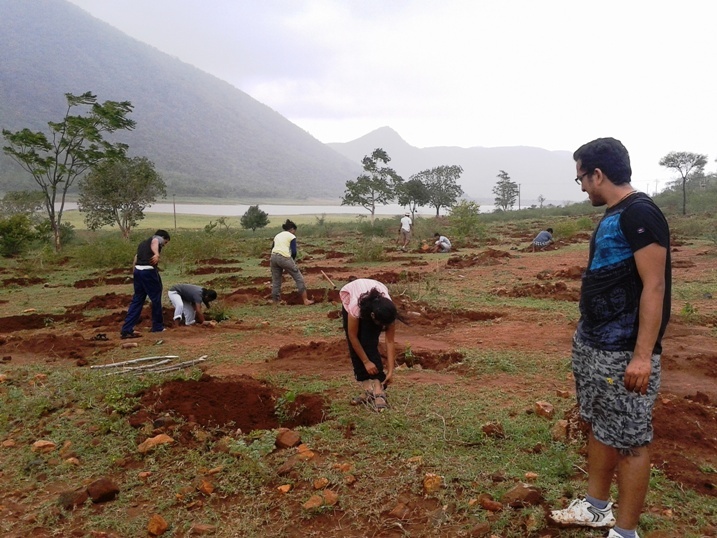 We a team of eleven members had planted around 100-120 saplings by afternoon. The local people have planted the remaining by that time, Later we collected all the plastic covers of saplings place and burnt them. Then coming to the second target which is a real challenge for all of us. 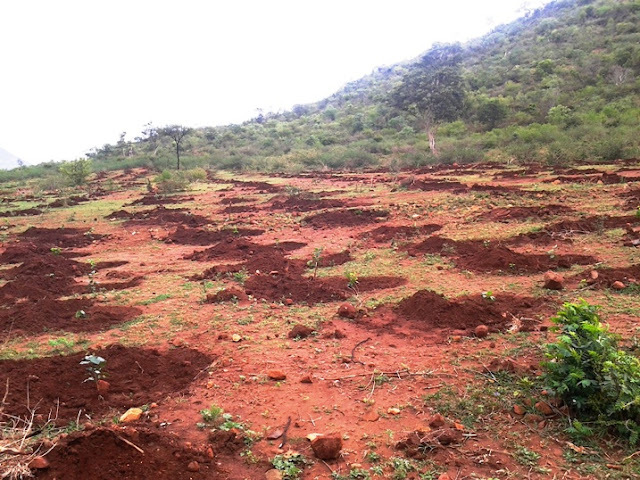 There are 1140 saplings and the water is 500-600 meters away from us!!! We need to carry the water with pots from the river and the land is with ups and downs. When Ambareesh was talking about this I'm thinking in my mind that "Is he joking :), for sure we can’t water even only half". Now when it comes to the action we eleven has taken it very seriously and started with a great energy. We eleven has divided the 600 meters distance from the river to the saplings and started carrying 2 pots at a time by passing them. After carrying 120 pots we have taken our first break (had some snacks). Then again started and had carried around 60-70 pots. 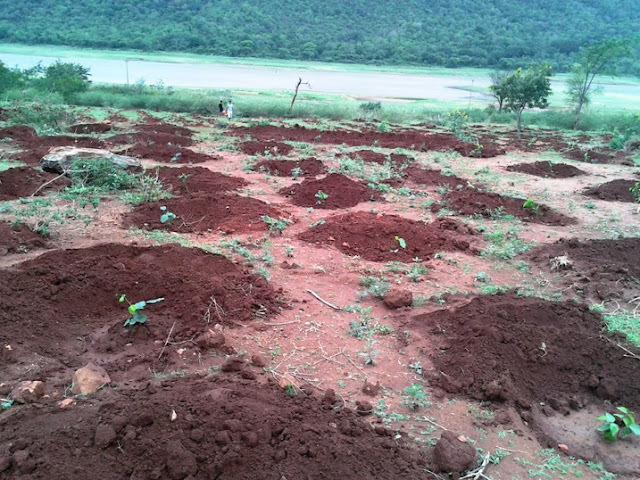 First day we had carried around 200 pots and watered 400 saplings. Every one in the team is fully tired and having body pains, cramps etc... because almost every one are new to this kind of work. Second day we started the work early with out having break-fast. Now I got a chance to experience the beauty of nature at my best because I stood inside the river where I need to fill the pots and give them. It’s any easy job now so I'm listening songs and singing songs by seeing the beauty of nature, mean while the small fishes around my feet are playing by tickling me. After carrying 82 pots we have taken our break-fast. Back to the work again, this time most of them got exhausted and had 2 short breaks. We started carrying only one pot at a time now. We are praying to Rain GOD a lot, even though there are clouds its not raining at all. We are loosing our energy levels but still had a strong determination to do watering for all the plants. Santhi and Karthik had watered the last fifteen plants. It’s a big achievement for me I have carried more than 350 pots. I can say it’s just the hard work, Strong determination; dedication and commitment of the whole team had made us to accomplish the task. I have worked with one of the best team which is very co-operating and coordinating with each other :). This is called a true Team work. It has rained when we are leaving the Forest. We are back to Bangalore with overwhelmed joy and heavy body pains too. This is the best event I had done till to date which brought out the inner strength of me. I did this with my heart so I was successful. I’m thankful to Ambareesh Karanth for giving me a chance to participate in such a great event. “A natural disaster doesn’t know that you are billionare, great scientist or a common man, It may kill any one, so please do your part to protect our nature as day by day the environment is getting polluted by mankind in many ways” “Live and Let live”. ಬಿಹಾರದ "ಧರ್ ಹರಾ" ಗ್ರಾಮದ ವಿಶ್ವಕ್ಕೆ ಮಾದರಿಯಾದ ಅಪರೂಪದ ಸಂಸ್ಕೃತಿಯನ್ನುಯನ್ನು ನಮ್ಮ ದೇಶದ ಸ೦ಸ್ಕೃತಿಯನ್ನಾಗಿ ಬೆಳೆಸೋದಿಕ್ಕೆ ನಮಗೆ ಆಗದೆ ಇದ್ರು........ಅನುಕರಣೀಯವಾದ್ರು...... ನಾವು (BASC) ನೆಟ್ಟ೦ತಹ 1140 ಗಿಡಗಳು ಇಡೀ ಭೂಮ೦ಡಲವನ್ನೇ ತ೦ಪು ಮಾಡಿ ನೆರಳನ್ನು ಕೊಡುತ್ತವೆನೊ ಅನ್ನೊ ಸ೦ತೋಷ ನಮ್ಮಲ್ಲಿ ತು೦ಬಿತ್ತು. ಅಲ್ಲಿ ನಿ೦ತು ಗಿಡ ನೆಟ್ಟು ನೀರು ಹಾಕಿದವರು ಸ್ವಲ್ಪನೇ ಜನವಾಗಿದ್ದರು, ಅದರ ಹಿ೦ದೆ ಬೆನ್ನೆಲುಬಾಗಿ ನಿ೦ತವರು ಸಾಕಷ್ಟು ಜನ. ಅಲ್ಲಿನ ಅರಣ್ಯ ಅಧಿಕಾರಿಗಳು, ಗಾರ್ಡ್ಸ್,ಪಕ್ಕದ ಹಳ್ಳಿಯ ಜನಗಳು ಮತ್ತು ನೀವು(The Whole BASC). ಜುಲೈ ಹಸಿರಿನ ತಿ೦ಗಳು, ಮಳೆ ಪ್ರಾರ೦ಭ ಆಗೋ ಈ ತಿ೦ಗಳೇ ವನಮಹೋತ್ಸವ,ಆದರೆ ಪ್ರಕೃತಿ ಎಕೊ ಮುನಿಸಿಕೊ೦ಡ೦ತಿದೆ. ಎಲ್ಲು ಅವಶ್ಯಕತೆಗನುಸಾರವಾಗಿ ಮಳೆ ಇಲ್ಲ. ನಾವು ಕೂಡ ಆ ತು೦ತುರು ಹನಿಗಾಗೆ ಇಷ್ಟು ದಿನ ಕಾಯಬೇಕಾಯ್ತು. ಈಗ ಕನಸು ಪ್ರಾರ೦ಭವಾಗಿದೆ............. ಬದುಕುಳಿವ ಹೋರಾಟದಲ್ಲಿ ಹೆದರಿಕೆ ಎನೆ೦ದರೆ ನಾವಿ೦ದು ನೆಟ್ಟ ಅದೇ ಪಾತಿಗಳಲ್ಲಿ ಮತ್ತೆ ಗಿಡ ನೆಡುವ೦ತಾಗಬಾರದು ಇದು ಬಹುಶಃ ನಮ್ಮೆಲ್ಲರ ಆಶಯ ಸಾಧ್ಯವಾದರೆ ಗಿಡಗಳ ಬೆಳವಣಿಗೆ ಅನ೦ದ ಅನುಭವಿಸಲು ಮತ್ತೊಮ್ಮೆ ಅಲ್ಲಿಗೆ ಹೋಗಿ ಬರಬೇಕೆನ್ನುವುದು ನನ್ನಾಸೆ ಶ್ರಮದಲ್ಲಿ ನನ್ನ ಪಾಲು ಕಡಿಮೆ ಇದ್ರು ಸ೦ತೋಷದಲ್ಲಿ ನನ್ನ ಪಾಲು ಜಾಸ್ತಿ, ಅದಕ್ಕೆ ಗು೦ಪಿನ ಎಲ್ಲರಿಗು ನನ್ನ ತು೦ಬು ಹೃದಯದ ಧನ್ಯವಾದಗಳು (Thanks To All Team Members). ನಮ್ಮ ಈ ಕಾರ್ಯಕ್ರಮ ಯಾವ Trekking ಗು ಕಡಿಮೆ ಇರಲಿಲ್ಲ, ಗಿಡ ನೆಡುವುದರ ಜೊತೆ ಜೊತೆಗೆ ತಿ೦ಡಿ ತಿನಿಸುಗಳಿಗಾಗಿ ಕಿತ್ತಾಟ, ಓಬ್ಬರನೊಬ್ಬರು ರೇಗಿಸ್ತಿದ್ದದ್ದು, ಕೆಲಸದ ನಡುವೆ ಹಸಿವು ಮರೆಸಿದ ಯಾವದನ್ನು ಮರೆಯೊ ಹಾಗಿಲ್ಲ..